Recent Event: Cybersecurity Today: Meeting the Escalating Challenge. Pictured are: Jared Levy, Cyber Security Technical Manager, IBM; Mark Latham, Sourcing Governance Officer for GTA in the State of Georgia; Debi Hamill, IAOP CEO; and Steve Sheahan, Sales Integration Executive. This webinar on Aug. 15 featured cyber experts who shared key lessons learned in the war to protect data that is being waged daily across the public and private sectors. 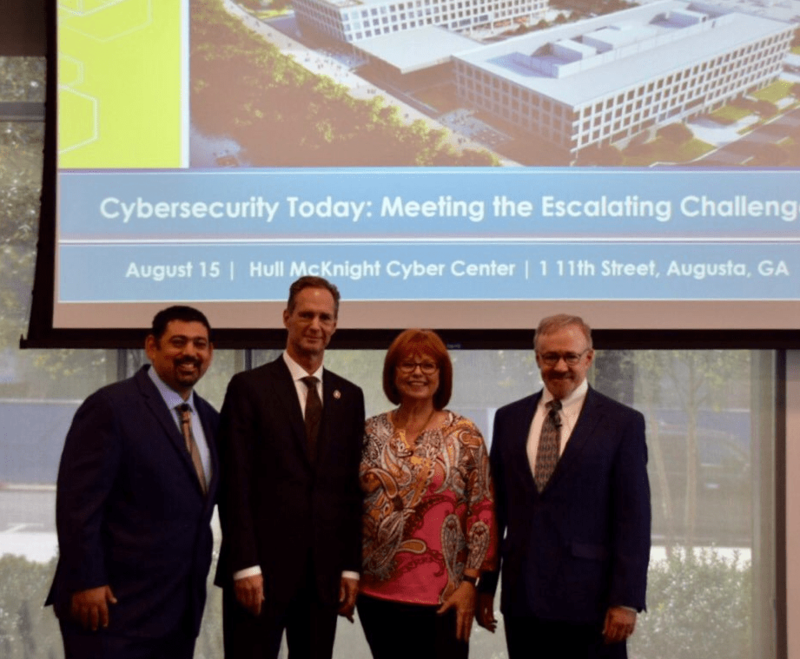 Sponsored by the Georgia Technology Authority, the event was live-streamed from the State of Georgia’s new Hull McKnight Cyber Center in Augusta with a guided tour of the facility following. Michael Shaffer, Executive Vice President of Strategic Partnerships and Economic Development for Augusta University and Health System, opened up the Atlanta Chapter meeting that also featured a welcome from IAOP CEO Debi Hamill. Charles Henderson, head of IBM’s X-Force Red team of super hackers, presented the keynote address. Other experts sharing insights included Jared Levy, Cybersecurity Technical Manager at IBM talking about Cybercriminals and Their Motivations; and CPT. Chris Apsey, Deputy Director, Cyber Technical College, U.S. Army Cyber School speaking on Courseware as Code: Setting a New Bar for Transparency, Collaboration & Rapid Improvement. Why get involved: The Atlanta chapter invites buyers, suppliers, advisors and academia to join to share and learn about all aspects of outsourcing in a common, open forum. The group works to advance the knowledge of all members regarding in-sourcing, ITO and BPO; on-shore, off-shore, and near-shore; from RFI through contract renewal and renegotiation. Get involved to share best practices to achieve success and promote innovation. Visit our Atlanta Chapter page. For more on cybersecurity: Check out this article!